If your figure is of the shorter and plumper variety, don’t despair. You can still find clothes that are fashionable and will make you look feminine and pretty. 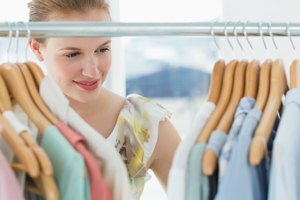 Rather than relegating yourself to frumpy, bulky outfits that just make you look bigger, search for clothes that fit you properly and make the most of your curves, accented with eye-catching accessories. Wear simple dresses that fit your curves and show off your best points, such as a narrow waist, generous bust or great legs. Shorter dresses look best on short women, but don’t go too short. While you have no need to hide behind your clothes, overly revealing styles aren’t flattering either. If you’re self-conscious about a particular part of your body, such as your upper arms, then chose a dress that will cover that area while still remaining feminine and stylish. Pair your dress with high heels to give your legs a longer line. To get the longest look possible, wear long pants that come down almost to the floor and pair them with heels. Don’t wear overly tight or tapered pants that make your hips and thighs look larger by contrast. Wide legged pants or boot cut trousers will be most flattering. As an alternative, try leggings, but only under a long tunic or short dress. In fact, leggings and tights can give you the coverage you need to dare that shorter skirt without feeling exposed. Well-chosen accessories can enhance your figure and make you look trendy and sophisticated. If you have a narrow waist, display it with a fashionable belt, worn under your bust. Elastic belts are available if you aren’t comfortable in standard ones. Jewelry and purses should be in proportion to your size; if you wear or carry something too small, it will just make you look bigger, so think large purses and chunky jewelry. Top it off with a hot pair of sunglasses that flatters the shape of your face. Your goal in dressing is to elongate your body, so avoid clothes that work against that. Go for vertical stripes, not horizontal, use lots of monochrome fabrics rather than busy patterns. Don’t wear short skirts that end at the widest part of your thighs or capri-type pants that cut your legs in half. Don’t wear tight clothes, as they will show every ripple of fat, or baggy clothes that add extra bulk. Eschew turtle necks in favor of V, scooped and square neck sweaters.